Uncategorized, What The Hell Is That? But before people hoping to lose weight indulge in an extra scoop of chocolate fudge swirl, the researchers caution that the study doesn’t prove a link between frequent chocolate munching and weight loss. Huh? Does it make you slimmer or not? Make up your mind, WSJ! Well, never mind that; it’s off topic. Anyway, even if, hypothetically, they laced the questionnaires with sodium pentothal so that everyone would tell God’s honest truth, they’re missing a massive confounding factor. Was the chocolate a cause, or an effect of the healthy lifestyle? However, walking the middle road, if you can do it, is about as close as you get to having your cake and eating it too during your time onstage in the Human Comedy. A little chocolate here, a little wine there and not only are you less inclined to binge, but you tend to be less stressed out in general. And, as we all know, stress has a biochemical influence on weight gain. But as mixed martial arts, Super Big Gulps, The United States Congress, and our burgeoning waistlines prove, moderation is not a thing that Americans do well. In the wake of this “study,” I’m fairly sure that thousands of struggling dieters have embraced the Atkins + Chocolate Eating Plan, where they still avoid carrots and bananas like the plague, but shovel down candy bars like Augustus Gloop looking for the Golden Ticket, assuming that all the HFCS and refined sugar that comes with these confections won’t have a negative impact cuz, like, chocolate is good you, right? 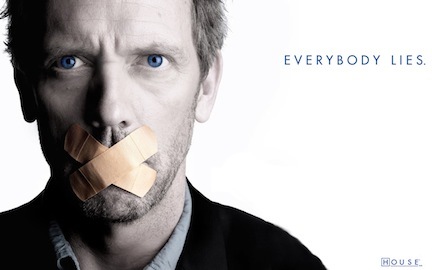 Because you posted this with a picture of House, I now envision you as the Hugh Laurie of nutritional/fitness research. Wow. Those are huge shoes to fill. I’ll do my best! I am a in the medical field and do extensive dietary teaching on a daily basis. i tell my clients that it is not good to abstain totally from sweets as it sets you up to fail and well…binge. I do believe that chocolate intake judiciously is not a bad thing. I encourage clients to indulge in dark chocolate in small amounts if they have a sweet craving. Dark chocolate has fewer carbs than other desserts and is packed full of the heart and mood healthy compounds. I have 2 tablespoons of dark chocolate chips when I am having a sweet attack and it does the job. I think in whole scheme of things this is pretty harmless on overall health and could be beneficial based on recent Swiss studies than show decreased stroke rate in women who consume chocolate in moderation. How awesome is it that the ad below this article was for Dove chocolate, and the ad that popped up when I commented was for M&Ms. Yeah, just like Laurie is pretending to be a Doctor, Faye is pretending to be a nutrition/fitness expert. NO food is off limits. Eat anything you want. Just don’t eat the entire Halloween bag of candy and you’ll be fine. And, of course, this study is another case of correlation =/= causation. But they know they’ll get a few headlines if they publish it. As usual, my critics don’t have the balls to sign their names to their digs. Where in this post do I tell people not to eat chocolate? I believe “There are, indeed, benefits to moderate chocolate consumption” sums it up. Hit him with your cane! Do it! Do it! But yeah, “Anonymous”-you jumped the gun a little there, buddy. Maybe you missed the entire paragraph about walking the middle of the road and enjoying a little chocolate and a little wine here and there? RadDad: That is most awesome.